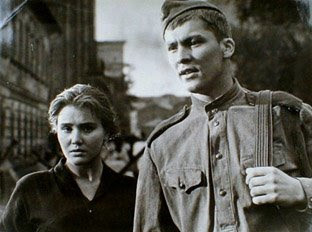 Ballad of a Soldier is a sweet Russian film made in 1959. 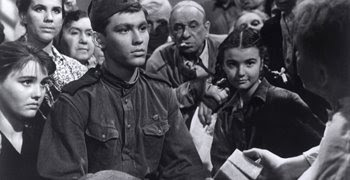 It tells the story of Aloysha, a nineteen year old boy serving in the Russian army during World War II, and Shura a girl he meets on his journey home to fix his mother's roof. He rather accidentally merits a medal for a heroic act he commits on the front, but he asks for a few days leave to visit his mother instead. 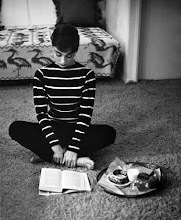 This movie is definitely one of my favorites and so absorbing that you forget that you are reading subtitles! Though, really only covering a few days in Aloysha's life, you really get a good glimpse of his character and (at least for me) this movie is easily a tear-jerker. It shows how much you can touch a person's life just by a kind word or a brief meeting. Aloysha seems to belong to one of the class of diminishing men...kind, thoughtful, sweet, shy...his character is a favorite of mine. If you haven't seen this movie yet, I would definitely recommend it. It isn't easily found, but worth the hunt! Thanks for the review, Emily! I'd never heard of this film before, but now I'm quite intrigued. Sounds like a wonderful film. 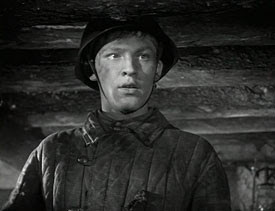 I usually try to tear-jerkers and especially films about war...just too sad for me. You can watch the whole thing on YouTube. Here's the link to part 1: http://www.youtube.com/watch?v=qmJpmA2oB48 I haven't watched it yet myself, but I think I must now after your recommendation. I put it on my family's Netflix Queue. Yippee! !